i. An indulgence of 300 days, daily. ii. A plenary indulgence to all who shall assist at these Novenas every day, and who shall afterwards, either on the Feast-day itself, to which each Novena respectively has reference, or on some one day in its Octave, after Confession and Communion, pray to our Lord and to the Blessed Virgin ac cording to the pious intention of the Sovereign Pontiff. Deus, qui corda fidelium Sancti Spiritus illustratione docuisti: da nobis in eodem Spiritu recta sapere, et de ejus semper consolatione gaudere. Per Christum Dominum nostrum. R. Amen. GLORY OF MARY AFTER DEATH. In her Assumption into heaven. i. Sovereign Queen of the universe, who for thy incomparable merit art raised to such high glory in the heavens; in thy pity look upon our miseries, and rule us with the gentle sway of thy protection. ii. 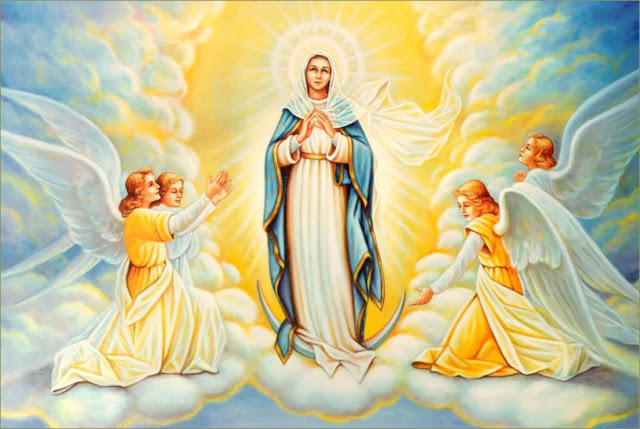 Sovereign Queen of the universe, who art ever receiving the worship and homage from all the heavenly hosts; accept, we pray thee, these our invocations, offered with such reverence as befits thy dignity and greatness. iii. Sovereign Queen of the universe; by that glory which thou hast by reason of thy high place in heaven, vouchsafe to take us into the number of thy servants, and obtain for us grace that, with quick and ready will, we may faithfully keep the precepts of our God and Lord. V. Exaltata est Sancta Dei Genitrix. R. Super choros angelorum ad coelestia regna. Famulorum tuorum, quaesumus Domine, delictis ignosce: ut qui tibi placere de actibus nostris non valemus, Genitricis Filii tui Domini nostri intercessione salvemur. V. The holy Mother of God is exalted. R. Into the heavenly kingdom above the angel choirs. We beseech thee, Lord, pardon the shortcomings of Thy servants; that we who by our own works are not able to please Thee, may be saved by the intercession of the Mother of thy Son our Lord Jesus Christ.. Who, & c.